I was inspired by the colors used in Marsha's sample. I also wanted to sneak in another Mother's Day card for the challenge. I re-purposed Christmas chipboard for the base of my sentiment and added a little bling for the final touch. Happy Sunday! I love that herringbone panel and the pointed ends! The chipboard piece with the gold edges looks amazing! NJ! Linda, Very nice card. Good job on re-purposing that chip board. Love the herringbone. 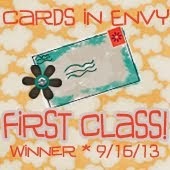 Great card - I love the mix of colors and patterns plus the interest the shape of the sentiment base gives. Hope your Sunday is great too! Love the herringbone with the green! Great card! Oh pretty... I love that bling! Nice colors. . . 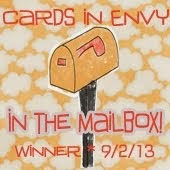 Thanks for sharing your pretty sketch card! Beautiful card, Linda! Love that houndstooth! Thanks for joining us in this week's OWH Stars & Stamps Sketch Challenge! This is so pretty. I love your choice of patterns and colors. Great job! Such soft, pretty colors. They make a beautiful card. This is a beautiful Mom's Day card, Linda!